My mail came late yesterday and I didn’t bother to go get it. This morning I opened the box at the top of the drive and in it was a square lightweight box addressed to me from a Jude Gelinas from New York. My first thought was it was from some obscure public relations (PR) woman as not a week goes by that I don’t get a new tool, or home-building product sample from any number of PR folks. I’m the AsktheBuilder.com guy and PR people pitch me constantly about new tools, products and services for contractors and homeowners. My vanity call sign is based on my business. Get it? Wrong! 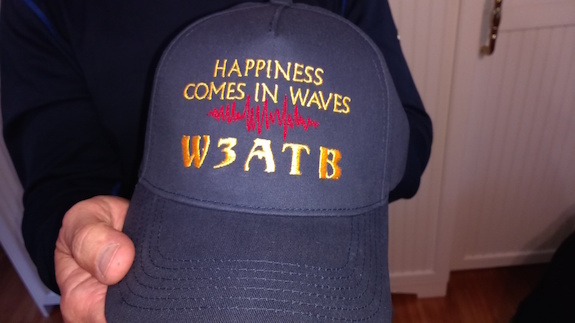 It was a wonderful custom ham radio hat! Jude is a licensed radio operator like me. Her call sign is W2AYV. It was her dad’s call sign and she got it as a vanity call in his honor. That’s very cool. Jude also does custom t-shirts and embroidered polo shirts. CLICK HERE to see her Etsy store. I called Jude and sent her an email to this story. She got back later in the day and it turns out my very very good friend Dan Murray is the instigator of all this happiness! I didn’t see the sun rise on Saturday June 17, 2017 as I was up early to drive to Mt. Washington. The clouds were thick, low and it felt like it could rain at any moment. With the official start to summer just days away, this was the first radio event of the 2017 season for me up on the Rock Pile as it’s affectionately called by those who frequent Mt. Washington. 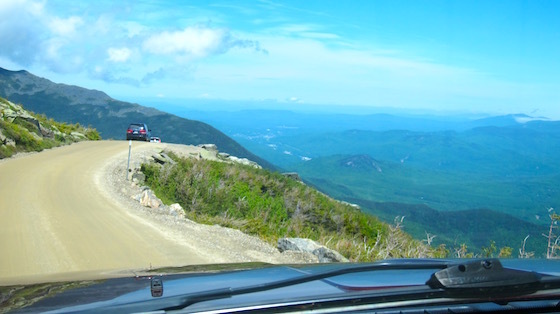 Hundreds of other people were driving to the base of the mountain to participate in the Mt. Washington Road Race. My immediate thought as I was pulling out of my driveway was that if it was this bad at my house, it was going to be a brutal day on Mt. Washington, a peak that’s known for some of the worst weather in the world. But Mother Nature had a treat in store for me and all others that were making the pilgrimage to this sacred part of the White Mountains. When I passed Pinkam Notch, just a few miles from my destination at the Mt. Washington Auto Road, the clouds disappeared revealing a glorious sunny day! Professional, serious and casual runners were going to see if they could run or run/walk up the seven-plus mile torturous serpentine roadway that rises up nearly 5,000 vertical feet in that distance. The Central New Hampshire Amateur Radio Club has provided the emergency communications for this event for years and it was great to see lots of familiar faces in the small shed that serves as the wood shop during the week and the command center for net control on event weekends. As I walked to the shed to get my assignment, I grinned as I passed by the sectional aluminum mast that held the antenna for the primary net control radio. This radio is the communications hub connecting all the radio operators spread out from the summit and finish line all they way down the flanks of the Northeast’s tallest mountain. The video above shows this same antenna being erected five years earlier at the Newton’s Revenge bicycle race at Mt. Washington. I recalled the end of the video as I walked past the mast. The same piece of romex cable was holding the mast straight as an arrow on this balmy morning. If you’re not familiar with the communications protocol during a race like this, the radio operator at net control has lots of responsibility. Should a runner / walker get into trouble and need aid, one of the many operators along the course would immediately reach out to net control who would dispatch a roving team of medics. A week before the event I had contacted Cliff Dickinson, N1RCQ, asking to be assigned to the infamous cow pasture just below the summit. This is a satellite view of the summit area of Mt. Washington. 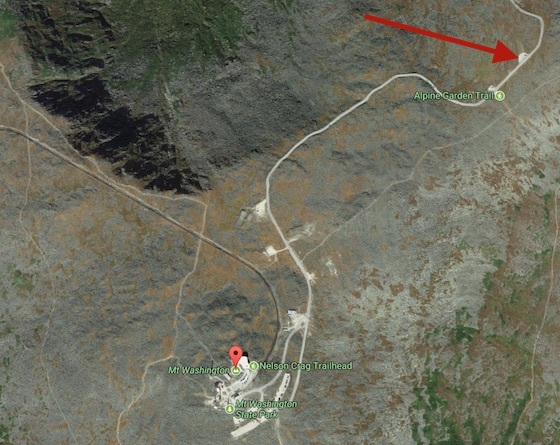 The red arrow points to the parking lot at the cow pasture where I was stationed. Copyright 2017 Google Inc. 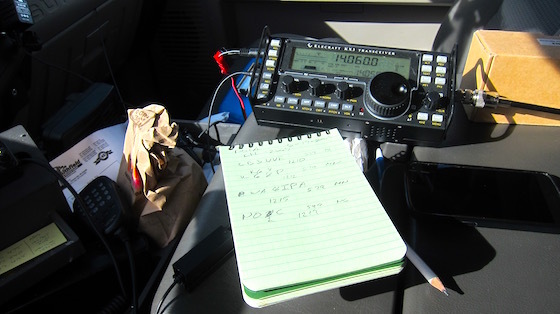 It was a selfish request because I wanted to set up my Elecraft KX3 HF radio and attempt to activate Mt. Washington State Park while I was waiting for the runners to get up to my position. 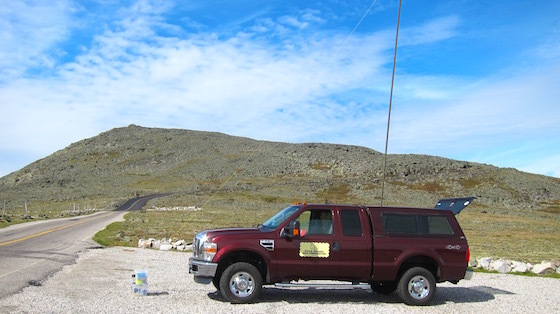 Last year I participated in the American Radio Relay League’s (ARRL) National Parks on the Air year-long event. When it ended on December 31, 2016, I gravitated to the ongoing Parks on the Air event. 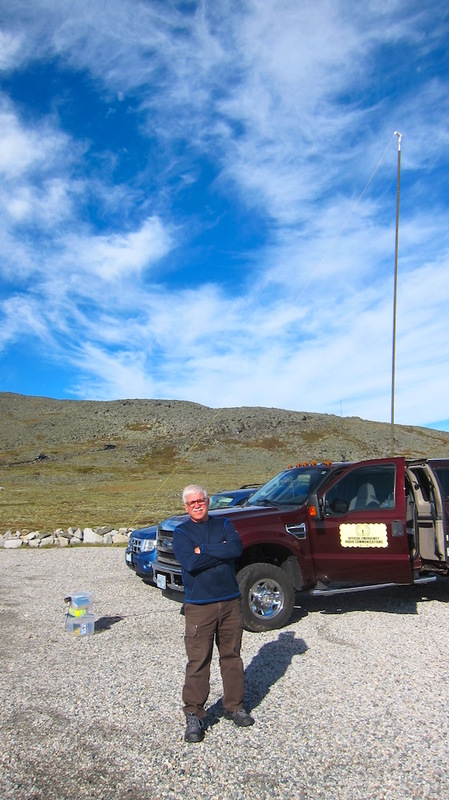 Once I arrived up at the cow pasture, it didn’t take long for me to get my own sectional aluminum mast antenna set up. Dangling from the tip was a 29-foot wire that sloped towards the east southeast. The propagation was not the best, but I was hearing stations on 20 meters. My first contact was with Emily Saldana, KB3VVE in New Bloomfield, PA. I was very happy my signal was getting out! After completing a few more QSOs, I got out of my truck and just enjoyed the peace and tranquility of the moment. It’s one of the reasons I love working these public service events up on Mt. Washington. If you’re a radio operator like me, you get to drive up the mountain about two hours before the event starts. Those who get an assignment up near the top like I did can enjoy the solitude of the mountain for almost two and a half hours. The foot and bicycle races normally start at 9:00 a.m. and it takes even the strongest participant fifty minutes to get to the cow pasture. This peace and quiet is not possible when the Auto Road is open to public traffic as cars, trucks and motorcycles are constantly going up to and down from the summit. Some runners and walkers were not prepared for the day. Normally it might be cloudy, windy and cool by the time they got to the cow pasture. On this day it would be sunny and warm. Dehydration and cramps were common. I was delighted to see that George Etzweiler was once again making the trek up to the summit. 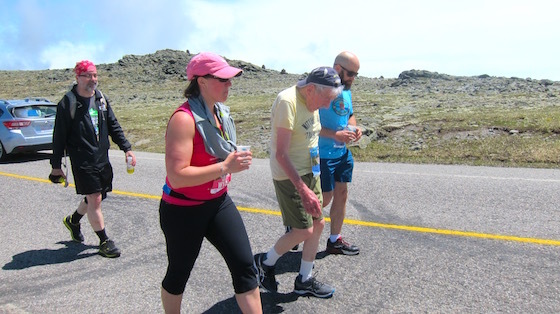 George is the oldest person to complete the race. This year he turned 97. He’s inspirational to say the least. As the runners thinned out and I had time to concentrate on working high frequency doing Morse code, I was able to successfully activate the site. 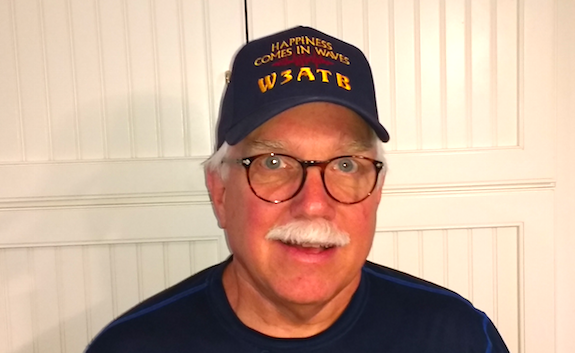 The Parks on the Air program requires that you make a minimum of ten QSOs and I was able to get fourteen. Once the last runner went past, I was released from duty and headed back down the mountain. The sun was still shining and the view to Berlin, NH was stunning. I don’t think I’ll ever grow weary of working public service events on this fabled peak. If you’ve not done it, you should consider it.